A year after formally entering the field of digital technology, the Taiwanese-based tech company Mach Xtreme has come to establish itself, earning award after award for its products which include solid state drives, memory modules and flash drives. In fact, back in October 2010, AllUSB had a review on Mach Xtreme’s MX-FX 3.0 USB flash drive. Now, the company introduces its latest product, MX-GX USB 3.0 flash drive, which is set to make waves in the market starting February 14th. Just like its predecessor, the MX-GX flash drive boasts SuperSpeed technology, which enables this device to process larger amounts of data into and out of a PC through its super-high transfer rate of 85MB/s read and 45MB/s write. Users may also download the MXTurboFlash to make the MX-GX’s performance 25% better! The flash drive also requires no separate power cable and its backward compatibility allows users to use it via USB 2.0 ports. Seeing the need of consumers of a faster and more capable data transfer, this USB 3.0 flash drive is totally quick and bidirectional while also having the ability to work within system requirements of computers today (and those in the future). What’s even more interesting—this latest USB 3.0 innovation is the slimmest 4-channel in the market today with a size of only 90mm x 18.5mm x 8mm and a weight of 25 grams. It has a single chip design that makes it compact with an extremely durable, shock- and vibration-resistant aluminum housing. This type of exterior enhances the flash drive’s attractive physique and portability – making it the perfect device for both the trendy and the frequent traveler. It would be even more eye-catching if it had the graffiti design of Mach Xtreme’s overall brand and some of its earlier products! The Mach Xtreme MX-GX drive comes in 8GB, 16GB, 32GB and 64GB along with a 2-year warranty. Although pricing has not been determined, the company assures consumers it will be budget-friendly. Let’s hope they give us discounts come Valentines’ Day. 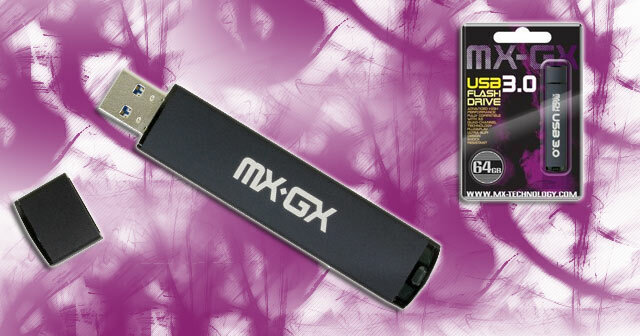 For your next USB 3.0 device, would you get the new MX-GX? Don’t forget to share your thoughts with us! This entry was posted in Articles, Flash Drive, Mach Xtreme, Mach Xtreme Technology, SuperSpeed USB 3.0, USB 3.0, USB Flash Drives, USB Jewelry and tagged Mach Xtreme Slim MX-GX USB 3.0 Flash Drive Makes Valentines Day Debut, Mach Xtreme Technology, MX-GX USB 3.0 Flash Drive, Slimmest USB 3.0 Drives, Slimmest USB Flash Drives, USB 3.0 Flash Drive. Bookmark the permalink.